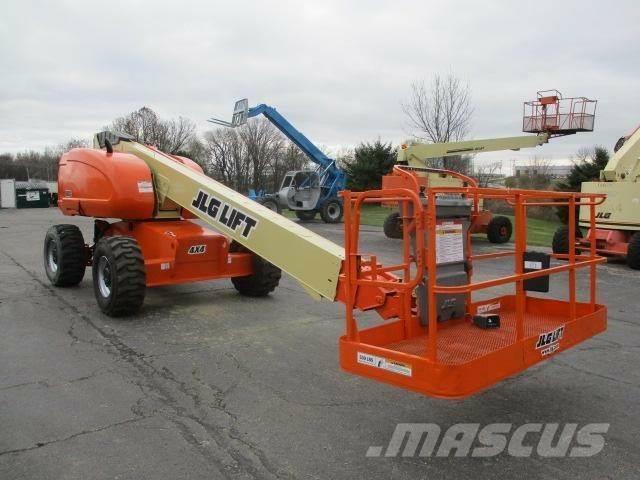 Overige informatie Description: This is a 2004 JLG 600S Telescopic Boom Lift. FULLY SERVICED. GREAT ROUGH TERRAIN PNEUMATIC tires that work indoor and outdoor, 4 WHEEL DRIVE that allows you to travel through rough terrain areas. Unit includes 360 DEGREE rotation with 160 DEGREE rotation on the Platform. 96" WIDE BASKET. Oscillating axle. 500 LB lift capacity, Platform reach height is 60 feet with a 66 foot work height and a horizontal outreach 49'..great for going up and over something. Unit has a STRONG DEUTZ DIESEL FUEL ENGINE. This is one of JLGs most popular and hardest to find units. Unit has fresh factory paint, new decals, is fully serviced, includes required annual ANSI inspection and is ready to work. Low hours well maintained truck. DEALERS would charge you $105,000 FOR THIS LIFT BRAND NEW. Call me with any questions at 716-568-4135 - available 7 days a week. Unit Dimensions are: 29 feet long, 96" wide, and 98" high. Weight is only 22,600 lbs. ONLY 3032 HOURS. FINANCING AVAILABLE FOR ALL CREDIT TYPES.